It's been a busy month behind the scenes of EatDinner.org, as is often the case when days stretch out between blog posts. I have been working to launch a new project: Blog for Family Dinner, which is a collaboration of Billy Mawhiney of Time at the Table, Kathleen Cuneo of Dinner Together and myself. I am thrilled to announce that the project website is up and running. Woo-hoo! I hope you’ll check it out and lend your support. Blog For Family Dinner (B4FD) is about creating a community of people who believe in the power of family dinner—bloggers, writers, parents, researchers, health organizations, and just about anyone who can see the far-reaching benefits of family meals. We are starting with a month-long promotion, from September 26 to October 24, 2011, that will feature daily blog posts from popular and emerging bloggers. We hope to highlight compelling stories, tips, advice and recipes, and most of all, inspiration for readers to make a commitment to family meals in their life. We are collecting submissions now, please to add your voice to the community. It can be a brand new post or one you’ve posted before. It can be a personal story about what family dinner means to you or a diatribe about how hard it is to pull off. You can let us know how the work of your organization helps support families value healthy meals or how the latest findings of your research center help us to better understand the problems parents face. Your post, personal story, or organizational report will be reviewed and considered as a Featured Blogger for Family Dinner. We even have a nice badge for you to include on your website. Join us! Add your name as a supporter, share your URL to become part of our Blog Roll, spread the word of Blog for Family Dinner via Twitter, Facebook, or your own platform. 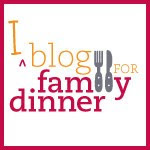 Thank you for supporting Blog for Family Dinner!